New Bearville Times Gift Available Today! There is a new version of the Bearville Times out today with lots of fun new Bearville information! Make sure to read yours through to the end because you will be awarded with a new green visor as shown below. Special thanks to forum member Christmas for pointing this out! Bearville Insider Member Earns Chalkboard Reward! 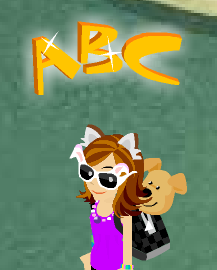 One of our Bearville Insider forum members has earned the coveted Chalkboard Collection prize! Danielagirl15 was the first to let us know about the awesome chalkboard she received when completing the collection. When you walk up to the chalkboard, it makes you write the formula “E = mc2″. So keep working on your collections so you can earn one too! Visit Bearemy for National Teddy Day Gift! 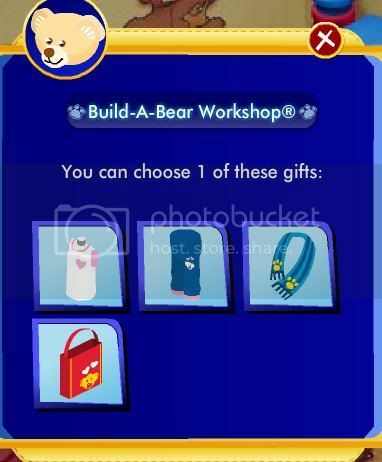 Thanks to karenbearhug for letting us know that if we visit Bearemy today we receive a special gift in honor of National Teddy Bear Day! September 9th is National Teddy Bear Day and to celebearate, BABW is running an online exclusive sale! From Sept. 9th -12th you can take 20% all make your own furry friends purchased online! Remember – this is an online exclusive and the deal is NOT available at your local BABW store. 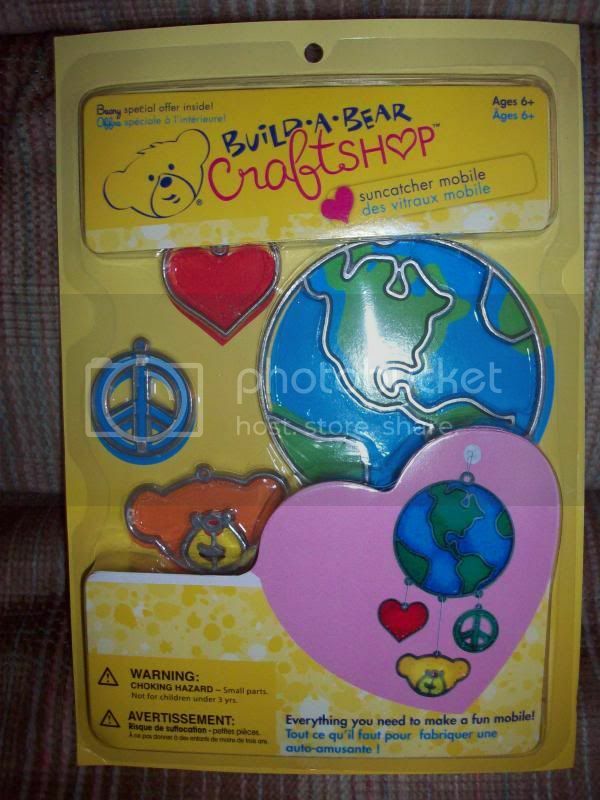 BuildABear CraftShop Items with Codes Now Available at Michaels Craft Stores! In conjunction with the opening of the new Art Gallery sponsored by Michael’s Craft Store in BuildABearville, all Michael’s stores are now selling BAB Craftshop items! 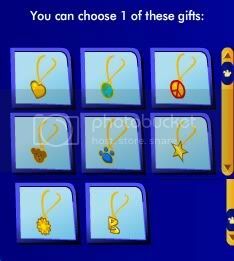 Bearville Insider member Spikefan2004 was lucky enough to pick up some of the new items that are available. There are several kits available, and below is an example of the Suncatcher Mobile kit. If you purchase either the big red tote kit or the scarf kit (which retail for $14.99 USD), you get to select a clothing item! There is also a card making kit that gives you a code for a giant craft marker and sticker kits which give codes for 500 bear bills each. There are tons of new items at Michael’s for Bearville fans! New Chloe Show Now Through September 15! Thank you to forum member Snewdles for pointing out there is a new Chloe Show running now through September 15th! The show features Jake from Radio Disney’s “Celebrity Take with Jake” radio show. Everyone who attends also gets a cool looking pair of sunglasses and fun new move as shown in the photos below. Make sure to swing by the Chloe show before Sept 15! MiguelSunshine and Greentracks Sept 2010 Gifts Uncovered! Thank you to member moonbow for uncovering the September gifts from MiguelSunshine and Greentracks this month! Greentracks is giving out an ABC emoticon and Miguel is giving out a school bus emoticon. Check out the photos by 99Valentine below! Winners of the Bearville Insider August Banner Contest Announced! As many of you have probably noticed, it’s time for a banner update to celebrate the Fall season! Thanks to all of our forum members who entered the August monthly contest to create a new banner. We had a difficult time selecting a winner, but we ultimately selected ValentinaHug‘s banner. She wins a Lil Coconut Cub code and will also have her banner featured on the site! Keep an eye out for her new banner soon. In addition, Anastasia411 created an awesome banner that we plan to use for Halloween. Check it out below! For her efforts, she wins an England Wall Chart code! Lastly, all contest entrants were placed in a random drawing to win another England Wall Chart code! The winner of the drawing was DanicaAllHeart. Please join me in congratulating our winners and stay tuned for another great contest from the staff here at Bearville Insider! New Trading Card Collection Available at the Furbulous Fountain! Thanks to member EveAllHeart52 for letting us all know there is a new trading card collection available. You can collect the cards by playing the Furbulous Fountain, and once the collection is complete you get a cool looking chalkboard! Just in time for back to school!